Even though I grew up here in Northern Virginia (Arlington), I'm always pleasantly surprised to see the opulence of Spring here. :) Everything is in bloom. Azaleas---pink, lavender, white, orange, deep rose pink. Dogwood trees---pink dogwood and snowy white dogwood blossoms. Gorgeous. Crabapple trees, fluffy pink bunches of blossoms. White apple blossoms. And---can't forget the pink cherry tree blossoms. Strolling beneath the rows of cherry blossom trees winding around the Tidal Basin. Virginia and Washington, DC, right across the Potomac River, are redolent with blossoms. If you have a chance to visit this vicinity during Springtime---do yourself a favor and come. Treat yourself. You will not regret it. Now----here are more Appetizer Recipes! Hot and Cold, dips and rollups, and Pizza is a popular theme. Enjoy! Laura Smoot -- Pizza Roll: 1 package refrigerated Crescent Rolls (I use Pillsbury); 1 cup shredded mozzarella cheese; Pre sliced pepperoni (I use Hormel); Preheat oven to 325. Open crescent rolls and carefully lay them out on a cutting board. Press together where the pre-cut lines are so you have one large rectangle. Lay pepperoni out in a single layer all over the crescent rolls. Sprinkle with mozzarella. Carefully roll the the crescent roll into one large roll keeping pepperoni and mozzarella inside. Slice roll into 1/2" pieces and place on a cookie sheet. Sprinkle each one with a little mozzarella. Bake for 10 min and enjoy. Matt Hatfield -- Hot: 1 pkg. Philadelphia Cream Cheese; 1 lb of Sausage (I prefer homemade sausage) but this is your selection; 1 can of Pillsbury Crescent Rolls. 1. Fry Sausage in pan as if you were frying ground beef. Cook thoroughly. 2. Soften Cream Cheese in a microwavable bowl. 3. Combine sausage and cream cheese. 4. Grease cookie sheet. 5. Roll out crescent rolls, placing about a tablespoon of cream cheese and sausage in each roll. 6. Roll each crescent with cream cheese/sausage filling with both ends closed. 7. Bake at 350° for about 20-25 minutes (until golden brown). Serve with bread, crackers, etc -- your choice. Heather Johnson -- COLD DIP: One packet of cream cheese, 8oz., softened (I use the block of philly's)One regular size can of refried beans, 10oz approx.One jar of salsa, 16oz approx. (I use mild, but you can use whichever you prefer) Approx. 2 cups of shredded cheese (I prefer Kraft's 4 cheese mexican, but anything sold preshredded will work) One bag of tortilla chips Optional: Chopped tomatoes, scallions or sliced black olives. 1. Mix cream cheese and refried beans together, I prefer using an electric hand mixer, my aunt does it by hand. Spread completed mixture in bottom of cake pan. 2. Spread salsa evenly over cream cheese/refried bean mixture. 3. Spread shredded cheese evenly over salsa. 4. Optional step: Tomatoes, scallions or olives can be added on top of the cheese for decorative purposes. Serve cold with bag of tortilla chips. I try to make this ahead of time and refrigerate overnight, I think it brings out the flavor better. Liz Veronis -- Tzatziki Dip w/raw vegetables: Tzatziki dip with raw vegetables.Mix thoroughly: 8 ounces of plain, whole milk Greek yogurt (American yogurt requires draining excess liquid through cheesecloth). 2 cucumbers, peeled, seeded and diced, with excess liquid squeezed out. 2 tablespoons olive oil. juice of 1/2 lemon. 1 tablespoon chopped fresh dill. 3 cloves garlic, peeled. Some recipes call for salt and pepper to taste, but we are salt-free. Refrigerate, covered, for 1 hour. Traci Kisbaugh -- Triscuit Melts (Super Easy): Triscuit Melts--Easy..put Triscuits on a plate, sprinkle shredded cheese on them...microwave long enough for the cheese to melt, then eat. package mozzarella cheese (shredded); tomato (diced); scallions (sliced). Spread softened cream cheese on round platter, pour chili sauce on top and spread evenly. ( I like to leave a small area uncovered by sauce to look like pie crust) Next garnish with shredded mozzarella, tomato and scallions. 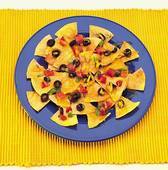 Serve with tortilla chips, the scoop kind work the best or your favorite dipping chip. Sounds tasty, only I have no idea what some of the words are. Triscuit? Scallions? Is that a brandname perhaps? Aurian -- Triscuit is a brand name for a cracker; scallions are basically green onions.